Congratulations! You've been nominated for Best in Show: Blog in the Third Annual WEGO Health Activist Awards. Take a moment to recognize your Health Activists Heroes by nominating them for the #HAAwards from @wegohealth: http://bit.ly/18RTDjw. Congratulations again and thank you for helping us to recognize all of the great work being done in the online health community. If you have any questions, please email us directly at community@wegohealth.com. This MEBO Blog has 1,305 English language posts, 264 Spanish language posts, and 71 Brazilian Portuguese posts. and other Posts of Note. 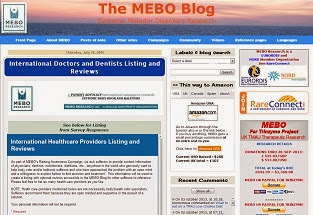 On September 9, 2013, MEBO wrote a blog post, WEGO Health, Empowering Health Activists, when we received an email from Susan Mees of the WEGO Health Team, in which she invites us to become involved in their discussions ans speaking opportunities on health issues. WEGO's goal is to bring together bloggers, tweeters, and active community leaders to discuss their health condition, their favorite resources, and ways to help raise awareness and share information. Our goal is to equip our network with opportunities designed for the active contributor, relevant content, powerful educational resources and shareable interactive media. We hope that the bloggers, tweeters, and community leaders that we call Health Activists will find inspiration, strength and support here.